Saudi Arabia’s health service plan consists of two tiers that together meet all its citizens’ needs from preventive care through advanced surgery. The first tier consists of a network of primary health care centers and clinics throughout the country that provide preventive, prenatal, emergency and basic services. In addition, a fleet of mobile clinics provides remote rural areas with services such as vaccinations and basic medical care. These centers and clinics have greatly improved health standards by making health care available to the general public. They were key in reducing the Kingdom’s infant mortality rate from 68 per 1,000 live births in 1980, to 18 per 1,000 live births in 2003. Close to 100 percent of all Saudi children are vaccinated against common diseases. The second tier of the Saudi health service plan consists of a network of advanced hospitals and specialized treatment facilities. Located in major urban areas, these facilities are accessible to all. Like the centers and clinics, the hospitals and specialized facilities have also experienced a rapid growth. In 1970 there were 74 hospitals with just over 9,000 beds in Saudi Arabia. By 2005, there were 350 hospitals with nearly 48,000 beds serving 22.7 million people. Saudi Arabia’s ratio of one hospital bed for just under 500 people is among the lowest in the world. The Kingdom’s health care program is primarily run by the Ministry of Health, which operates 62 percent of the hospitals and 53 percent of the clinics and centers. The rest are privately operated, but their functions and staff training are supervised and supported by the Ministry. Some government agencies, including the Ministries of Education and Defense, the National Guard and the Public Security Administration, have their own hospitals and clinics. There are now about 34,000 physicians in both government and private health sectors. Twenty percent of those physicians are Saudi, with the rest from all over the world. 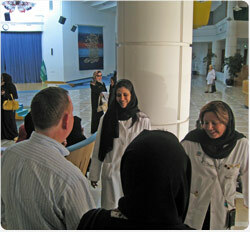 The number of nurses has increased to around 70,000, both male and female. The Kingdom has a number of specialized hospitals that provide quality care in a variety of areas, including obstetrics and gynecology, respiratory ailments, psychiatric care, eye disorders and contagious diseases. There are also a number of convalescent facilities. The King Faisal Specialist Hospital and Research Center in Riyadh is a prime example of Saudi Arabia’s modern hospital system. It has built a reputation as a leading medical and research center in the Middle East, and attracts patients from as far away as the Philippines, South Africa and the United Kingdom. It has departments in many medical fields, and performs both general and specialized surgical procedures. The King Khalid Eye Specialist Hospital in Riyadh is one of the largest eye hospitals in the world. Established in 1983, it has performed complex surgical operations including cornea transplants and laser procedures. The hospital also has a program to train ophthalmologists. Organ transplant procedures are routinely performed in the Kingdom. For example, the King Faisal Specialist Hospital and Research Center, which specializes in kidney and liver transplants, performs hundreds of operations annually, including bone marrow transplants. Saudi hospitals have also been pioneers in other types of organ transplants. For example, the first uterus transplant in the world was performed in 2001 at the Soliman Fakeeh Hospital, a private facility in Jeddah. Similarly sophisticated surgical procedures are performed at most Saudi hospitals. World-class cardiology centers in the Kingdom’s top hospitals routinely perform open heart surgery, and many medical centers throughout the Kingdom offer specialized cardiac care. The most famous of the hospitals specializing in cardiology is the King Fahd National Guard Hospital in Riyadh, which performs more than 750 cardiac procedures each year. There are other cardiology hospitals in Jeddah, Makkah, Madinah and Dammam. Recently, two cardiology centers were opened in Riyadh and Jeddah exclusively for the treatment and research of heart diseases. The National Guard Health Affairs organization has gained an international reputation for the separation of conjoined twins. In March 2006, the King Abdulaziz Medical City in Riyadh successfully carried out its 11th such operation, the 14th in the Kingdom since 1990. Another growing field in the Kingdom is dentistry. In addition to dental clinics and specialized dental hospitals, over 150 mobile dental clinics serve residents of remote villages. Saudi health care facilities conduct advanced medical research with potential benefits for patients around the world. For example, the research center at King Saud University’s School of Pharmacology has developed promising new drugs, including one for diabetes. At the King Abdulaziz University and King Saud University’s College of Science, scientists are studying radioactive biotopes to determine the effect of antibiotics on bodily functions. Scientists at King Khalid University Hospital are testing indigenous medical plants for potential benefits to cancer treatments. The National Guard’s King Abdulaziz Medical City in Riyadh is conducting research on artificial hearts. And the King Faisal Specialist Hospital and Research Center – along with similar facilities in the Kingdom – has recently been conducting pioneering research in the area of stem cell transplants. Another major program provides social security pensions, benefits and relief assistance to the disabled, elderly, orphans and widows without income. The Kingdom continues to ensure that the assistance meets its recipients’ needs by increasing the monthly stipends of social security recipients depending on individual status and need. Another aspect of Saudi Arabia’s social services network is providing housing for the country’s fast-growing, young population. The government has been active in both financing and constructing housing for low-income Saudis, public employees and students. A particularly important policy has been to provide interest-free, easy-term loans for home construction to individuals and companies. The Real Estate Development Fund was established in 1975 for this purpose. Since then, it has financed tens of thousands of private homes, and provided millions of dollars to the private sector to build housing units, stores and office buildings.